Students are shown tearing down an iron gate with ropes at the residence of the Japanese Premier Nobusuke Kishi June 1960 Tokyo, Japan. Students were protesting the passing of the Mutual Cooperation and Security Treaty between Japan and the US. The treaty set forth an obligation for each country to assist each other in case of armed attack, although ironically Article 9 of the Japanese constitution prevents Japan from sending military forces abroad. The Treaty would solidify American military influence in and would legitimize American military bases throughout Japan, which played important roles as potential jumping off points into Asia and especially Russia. The left movement, which encompassed the students seen in the photo, was angered at the military land grab made by the US and the loss of Japanese sovereignty. Surging forward, rioting Japanese students use ropes in an effort to pull down the iron gates outside the official residence of Premier Kishi here on June 3rd. 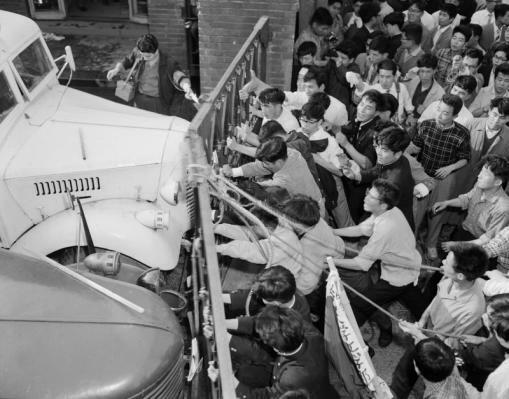 The students, protesting the signing of the Japan-US mutual security treaty, succeeded in pulling doen the gates, rushing into the courtyard, and smashing four riot trucks which were lined up there. June 1960 Tokyo, Japan.